Biography of Trigger, "The Smartest Horse In The Movies"
It seems like there wasn’t a child in the world from the late 1930s into the 1950s that didn’t instantly recognize the name Trigger. He was a cowboy’s best friend, a high rearing, fast running superhero that could shoot a gun and untie ropes, but still allow the weakest and most timid of children to sit safely on his magnificent back. Trigger was a horse, officially known as The Smartest Horse In The Movies, and he belonged to the King Of The Cowboys himself, Roy Rogers. In their hearts children knew that Trigger loved them, and dreamed that up on his back they could be a cowboy hero, too. Trigger brought sunshine into the lives of people worldwide, particularly children, with the brilliance of his golden coat, and with his bravery and brains on movie and television screens. He brought encouragement and hope to people in a very personal way when he walked quietly up stairs or rode in elevators to visit those who needed him most while they were in hospitals or shelters. As much as we love and remember his owner and best pal Roy Rogers, we also love and remember Trigger, The Smartest Horse In The Movies. The golden palomino stallion that would become famous to the world with the name Trigger was born on a ranch in San Diego, California. In researching this article we found conflicting information that he was born in either 1932 or 1934. The manager of the ranch was a man named Roy F. Cloud, and the name originally given to Trigger was Golden Cloud. Roy Rogers’ golden palomino stallion, Trigger. In 1938, the same year Golden Cloud appeared in “The Adventures of Robin Hood,” a young singing cowboy who had recently changed his name from Leonard Slye to Roy Rogers was cast in his first leading role in a movie. The movie was a Western called “Under Western Stars” and like any good cowboy the new leading man needed a horse. Several different stables in the area brought horses to Roy for him to try out. Roy remembered that there were six or seven really good horses to choose from, everyone of them good looking, fast, and well trained. One of those horses was Golden Cloud. When Roy Rogers rode Golden Cloud for the first time it was love at first ride. The horse had speed and power, an easy lope, and a calm and willing attitude. The young actor remembered that after he rode Golden Cloud he never even considered any of the other horses. One day after Roy had chosen Golden Cloud he was on the set of “Under Western Stars” practicing his quick-draw when the character actor Smiley Burnette, who played Roy’s sidekick in the movie, commented, “Roy, as quick as that horse of yours is, you ought to call him Trigger.” Roy liked the suggestion and began calling Golden Cloud by his new name of Trigger from then on. When “Under Western Stars” was released it was a success with critics and audiences both. It was a “B” grade Western but its popularity caused it to be shown in many first-run movie theatres. The crowds loved Roy Rogers and they loved Trigger, too. One of the most successful duos in entertainment history was born. 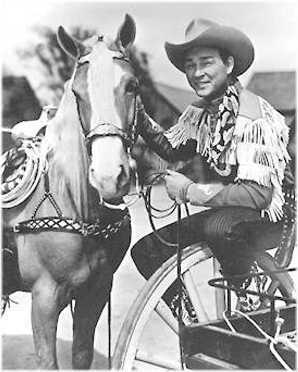 Publicity photo of Roy Rogers and Trigger. In the months after “Under Western Stars” was released Roy toured the country promoting the film. People everywhere asked him about the horse he rode in the movie, and he quickly realized that audiences loved Trigger almost as much as he did himself. From the beginning Roy openly and apologetically loved the horse, and wanted to own him for his own so he could not only ride him in more movies, but take him out on personal appearances, too. As the full measure of Trigger’s popularity began to sink in, Roy also realized that a huge part of his newfound stardom was because he had been paired with Trigger, and he began to worry that the horse might be paired with someone else. As badly as he wanted to own Trigger, however, and even though “Under Western Stars” had made him a star, he was a contract player with Republic Pictures making $75.00 per week. It hardly seemed like enough to take care of himself and his wife and have enough left over to buy a rising equine star. Note: When writing this article we were able to find photocopies of invoices for Roy’s purchase of Trigger from Hudkins Stables showing the first payment of $500 made in September of 1943, and a second payment of $2,000 made in December of 1943. However, the Roy Rogers, Dale Evans autobiography “Happy Trails, Our Life Story” indicates the purchase was probably made in 1938 or 1939 right after “Under Western Stars” was made with the payment amounts being smaller. Starting from Roy Rogers’ very first leading role in “Under Western Stars” Trigger appeared in all of Roy’s movies, 88 movies total by Roy’s count. 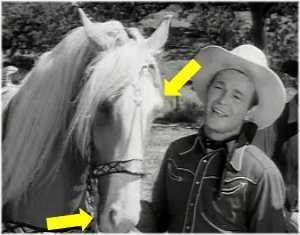 Trigger also appeared with Roy in all 100 episodes (some sources say 104) of The Roy Rogers Show on television, which aired on NBC from 1951 – 1957. As Roy Rogers career soared to super stardom Trigger carried him along for the ride, becoming just as much an American icon as his human counterpart. As soon as Roy had enough influence with the movie studio he insisted that Trigger got top billing, right along with himself. Trigger dazzled audiences with his beauty and brains, performing a seemingly endless list of tricks that included untying ropes and shooting a gun. While Roy and Trigger always stood for what was right they never let that get in the way of a lot of good, heart-pumping action. In movie after movie and in their television shows Roy and Trigger never failed to thrill audiences with their wild cowboy-and-faithful-horse adventures. Trigger and Roy not only starred in movies and television together but also made countless personal appearances all across the country, and tirelessly visited children in hospitals and shelters. Trigger’s star power was obvious to everyone from the beginning. It wasn’t only obvious to Roy and his fans, but also to Herbert Yates, the head of the movie studio Roy was under contract with. Not long after Roy and Trigger had established themselves as a highly successful team Mr. Yates wanted to cast Roy in a non-Western as a cigarette smoking, hard drinking reporter. Roy refused the part, telling Mr. Yates he knew his fans wouldn’t like him in that kind of a role and he didn’t want to let them down. Herbert Yates was furious at Roy’s refusal and retaliated by telling him that if he didn’t take the part he would take away his upcoming roles in Westerns. Not only that, Yates went on to say that he would let another actor ride Trigger, confident the horse could make a star out of anyone. The argument ended abruptly when Roy told the studio head that he had purchased Trigger for his own, and if Yates continued to try to cast Roy in the role of a drunkard Yates wouldn’t just be losing him in upcoming Westerns, he would be losing Trigger, too. As furious as he was Herbert Yates quickly backed down, casting someone else as the reporter and never taking away any of Roy’s cowboy roles, either. He had been angry enough to lose Roy, his wildly popular human star, but he wasn’t about to lose Trigger, too. Trigger retired from show business when Roy stopped doing “The Roy Rogers Show” on television in 1957. According to “Happy Trails, Our Life Story,” by Roy Rogers and Dale Evans, Trigger was retired to a stable near the Rogers’ home where he could roam through green grass and relax in the California sunshine. Trigger passed away peacefully in 1965. Assuming he was born in 1932, he would have been 33 years old at the time of his death. Upon hearing of Trigger’s death the Smithsonian Institute in Washington, D.C. asked Roy for Trigger’s body for their collection of historical Americana. Roy declined, not wanting Trigger’s final resting place to be so far away from himself out in California. Dale Evans, Roy’s wife and co-star in many of his movies and in “The Roy Rogers Show” on television, wanted Trigger to have a nice funeral with a beautiful headstone. Roy wasn’t comfortable with that idea either, not liking the thought of putting his friend and partner of so many years into the ground. Roy knew he wanted to preserve Trigger not only for himself but for all the fans that loved him too, so he contacted Bischoff’s Taxidermy, located at that time in Los Angeles, California. With great care Bischoff’s mounted Trigger’s hide over a plaster likeness of a horse in a rearing position, a famous pose recognizable to Roy Rogers and Trigger fans everywhere. The mounted Trigger was first put on display at the Roy Rogers-Dale Evans Museum when it originally opened in Apple Valley, California in 1967. The entire museum, including Trigger, was relocated to nearby Victorville, California in 1976. After Roy’s death in 1998 and Dale’s death in 2001 the museum was moved in 2003 to Branson, Missouri. Trigger, the museum’s most popular attraction, again made the move. Dale’s buckskin horse Buttermilk and Bullet the Wonder Dog (a German Shepherd who was also a family pet) were also mounted after their deaths and put on display at the museum, too. Sadly for fans of Roy Rogers and Dale Evans everywhere, the museum closed on December 12, 2009. 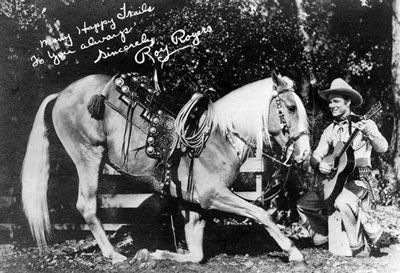 Roy Rogers’ and Trigger’s popularity soared so high so quickly that Roy knew early on that it would take more than one horse to meet his needs for movies, personal appearances, and later on, television shows. While the original Trigger was mostly reserved for movies and television, Roy purchased another palomino for personal appearances, a horse he called Little Trigger. Little Trigger was not registered with any breed organization and was used extensively by Roy for personal appearances in the 1940s and the 1950s and also appeared in some of Roy’s movies. Roy also purchased another horse to give the original Trigger a break. The second “other Trigger” was a registered Tennessee Walking Horse with the registered name of Allen’s Gold Zephyr, but Roy called him Trigger Jr.
Roy Rogers didn’t like to publicly discuss that there was more than one Trigger, and liked to keep up the outward appearance that there was just one. Roy knew that many of his and Trigger’s fans were children too young to understand that one horse shouldn’t be asked to keep up the same demands Roy himself kept. Roy loved his young fans, and never wanted the ones that saw him and Trigger in person to miss out on the thrill of believing they were seeing the horse they had fallen in love with on the movie and television screen right before their very eyes. Trigger with Roy Rogers in “Lights of Old Santa Fe,” (1944). This horse is the original Trigger. The white of his bald face extends over his left eye (upper arrow), and also completely covers his right nostril (lower arrow). A close-up of Trigger’s face in “Lights of Old Santa Fe,” (1944). This is also the original Trigger. Notice that his bald face does NOT completely cover his nostril on the LEFT side of his face. Not shown: The original Trigger had a left hind sock, but this sock was difficult to see in many of his movie and television scenes. Little Trigger and Trigger Jr., in comparison, had stockings on all four legs. Trigger’s first movie role was with Olivia de Havilland for her role as Maid Marian in the 1938 movie “The Adventures of Robin Hood.” Miss de Havilland may be best know for playing Melanie in “Gone With The Wind” (1939). She also won two Oscars, one for Best Actress in “The Heiress” (1949) and one for Best Actress in “To Each His Own” (1946). Roy Rogers purchased Trigger from Hudkins Stables of Hollywood, California for the amount of $2,500, paying for the horse on payments, Rogers said, “just like you would a bedroom set.” When writing this article we were able to find photocopies of invoices for Roy’s purchase of Trigger showing the first payment of $500 made in September of 1943 and a second payment of $2,000 made in December of 1943. However, the Roy Rogers, Dale Evans autobiography “Happy Trails, Our Life Story” implies the purchase was probably made in 1938 or 1939 with the payment amounts being smaller. In 1943 $2,500 was roughly equivalent to $30,000 today. Every chance he got when making personal appearances, Roy placed Trigger and his fancy horse trailer outside of the arena or building where they were appearing before the show. He wanted all the kids to be able to see Trigger, especially the ones that couldn’t afford to buy a ticket. Trigger’s finest saddles were made by Edward H. Bohlin, known as the Michelangelo of saddle making. Mr. Bohlin got his start as a famous saddle maker by making tack for Tony, the famous movie horse of cowboy actor Tom Mix. Many of Trigger’s saddles were covered in intricate patterns in silver and gold, and some of them weighed as much as 150 pounds. The word “palomino” is a description of a horse’s color, not its breeding. A palomino horse has a coat of varying shades of a yellow or golden color, and a white mane and tail. 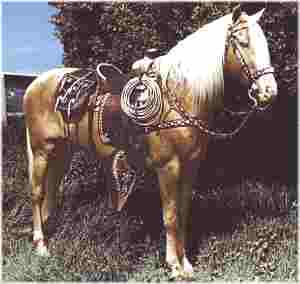 Trigger was a golden palomino, meaning his coat was a deep gold. While Trigger was not registered with any horse breed association, he was registered with the Palomino Horse Association, an association that registers horses according to their color as opposed to their breeding. Roy Rogers was careful not to overwork his equine partner, so, along with the original Trigger, there was also Little Trigger (not registered with any breed association) and Trigger Jr. (a registered Tennessee Walking Horse with the registered name of Allen’s Gold Zephyr). Neither Little Trigger or Trigger Jr. were related to the original Trigger. The original Trigger remained a stallion his entire life, but never sired any offspring. The Roy Rogers-Dale Evans museum was moved from Victorville, California to Branson, Missouri in 2003. Trigger, Trigger Jr., Dale’s buckskin horse Buttermilk, and Bullet the Wonder Dog (a German Shepherd who was also a family pet) were all mounted after their deaths and could be seen on display there. The museum closed on December 12, 2009. Trigger passed away peacefully in 1965. Assuming he was born in 1932, he would have been 33 years old at the time of his death.